I have been away due to a death in the family but I am back and trading again. 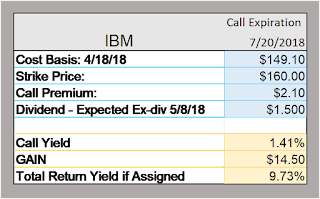 Consider this IBM trade. IBM is getting crushed today and I decided to take a chance on Big Blue. I remember a mentor of mine talking about IBM never really creating anything new. His view was they used their big blue boots to take over new ideas. Today's IBM is doing the same thing and it takes a while. With the positive points listed above what is the problem you might ask. Well, cloud growth in 2017 was 24% so that suggests cloud growth is slowing. Forward guidance on profit remained flat at $13.80 per share. And the balance sheet is not exactly pristine. D/E (debt to equity ratio) of 2.26 is well above industry standard which is 1.30. I can justify all the negatives with the positives noted above. And one theory of using cheap debt is that when invested wisely, it can be the catalyst for growth. Here is the trade I made today and the call I wrote on it. Note that I actually think IBM will increase the dividend. Their latest dividend increase from $1.40 to $1.50 or seven percent was four quarters ago. I expect a similar increase to about $1.60. I used the $1.50 dividend in my calculator for total return. Also note that these calls are volatile and you may get more or less of a premium if you make a similar trade. My bet on this stock is not for the long term. Long term to me is over three years. Rather, I think with the positive news noted in the bullets above, IBM's stock price will rebound. I will pocket the dividend and the call premium. If it the stock price does not reach $160 by the time the call expires, I don't expect the price to plunge again. You never know but that is my strategy on IBM. If it gets called away, I will be happy. If it does not, I will probably exit this position.